Page 11 of the annual catalog. These cards use washi tape or stamped pieces. Another option is to use up strips of leftover Designer Series Paper. 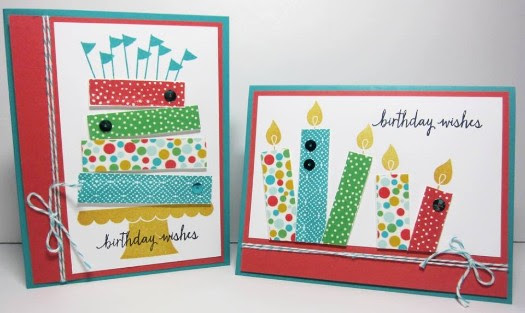 Whip up a bunch of cards using any method so you have a stash of birthday cards available! I go thru SO many birthday cards each year so I want to make sure I always keep a good stock. 1. The cake layers & candles are made up of either stamped images or washi tape or both. If you choose to stamp, then stamp the longest Build A Birthday block in Bermuda Bay ink, and the shortest block in Watermelon Wonder, onto Whisper White scrap card stock. Hand-cut (aka fussy cut) out. 2. 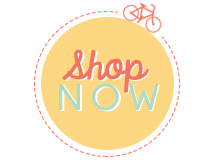 Apply the Cucumber Crush & colored polka dot Cherry On Top Washi Tape to scrap Whisper White card stock. Trim to desired length. 3. Cake Card: Stamp the cake base in Crushed Curry at the bottom of the Whisper White layer. Stamp the flags image multiple times at the top. 4. Stamp the sentiment in Memento Black. 5. Adhere all the rectangles with Dimensionals. 6. Candles Card: Adhere candles to Whisper White layer. Trim candle bottoms. Add Crushed Curry flames to the top of each candle. 7. Accent with 3 Bermuda Bay Sequins, attached with Glue Dots. 8. Adhere to the Watermelon Wonder layer. Wrap Bermuda Bay Baker’s Twine around the layer twice & tie into a bow. Adhere to card base.